For most of us, hunger is something that happens in far-away countries, not right here in our own backyard. 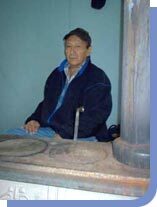 The Pine Ridge Reservation is isolated, without even basic necessities like fresh water. 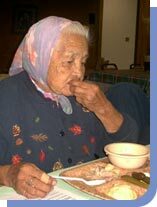 But on the Pine Ridge Reservation in South Dakota, malnutrition is one of the most prevalent illnesses that threaten the health of the Elders. 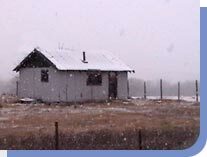 The reservation encompasses two of the poorest counties in the entire United States. Unemployment is a staggering 86 percent, compared to the national average of 5.5 percent, and a majority of the population lives below the federal poverty level. Children and the elderly are the most vulnerable. When they go to bed hungry, it hurts us all. How can compassionate Americans help these neighbors, without making them even more dependent and less able to help themselves? A helping hand, not a handout. 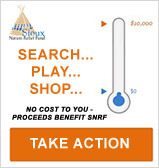 The Sioux Nations Relief Fund (SNRF) has one proven, answer; help Sioux Indians improve the quality of their own lives, by providing opportunities for them to bring about positive changes in their own communities. SNRF offers a helping hand, not a handout. How can I help? From emergencies to Elder nutrition. The (SNRF) sponsors programs that address a wide variety of needs, from natural disasters to Elder nutrition, for Sioux Indians on the Northern Plains. We work with Gift-in-Kind organizations and donors who provide items like food, clothing, shoes, blankets, baby goods, personal hygiene products, and cleaning supplies. We store these goods in the SNRF distribution center, process them, match them up with the appropriate programs, and ensure the delivery to the program site. Community involvement is the key. This is where SNRF differs from many other social service programs. SNRF insists that substantial community volunteerism be a part of the processing or distribution of these goods, or that the goods be used in an incentive program. All of SNRF’s programs are guided by nine guiding principles, the SNRF Way. The wood provided by SNRF not only heats food, but often is used to warm a cold home as well. Volunteerism, the heart of SNRF’s vision of strong, self-sufficient Native American communities, is achieved by working in tandem with Program Partners and volunteers. SNRF Program Partners are members of the community that will benefit from a SNRF program. That gives them an intimate understanding of the needs of their community. Program Partners identify priorities, arrange volunteer support, provide lists of people requiring assistance, obtain facilities for events, and volunteer their own time to help their communities. Working with Program Partners, SNRF ensures that we are addressing the genuine needs of a community. Volunteers carry out much of the preparation and distribution work associated with SNRF programs. People of all ages give of their time to help with special projects. 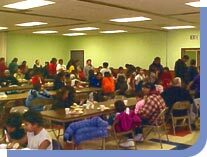 These range from community Soup Kitchens, holiday events such as Thanksgiving, and wood deliveries to Elders in need. This unique relationship with the communities we serve makes SNRF’s programs more of a partnership and less like charity. It follows the traditional Native American way of reaching out and supporting any member of the tribe who is in need of help. SNRF works closely with corporations and Gift-in-Kind charities who donate a wide variety of supplies. SNRF staff work with Program Partners to match these supplies with appropriate programs. These donated items allow SNRF to distribute new, quality goods in the most cost effective manner.